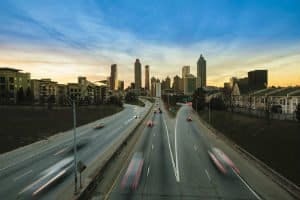 In April 2018, the Atlanta Journal-Constitution published the findings of a study that used motor vehicle fatality data for 2013 through 2015 to see which Georgia highways had the highest numbers of fatal crashes. Interstate 20, Atlanta — I-20 crosses Georgia from the state line with Alabama to the South Carolina state line. The stretch of I-20 that travels through Atlanta accounted for five deaths during the study period. 2. Interstate 75, Kennesaw — I-75 is a north-south interstate that also goes through Atlanta. There were five fatalities over a roughly two-mile stretch of I-75 during the study period. Mike Padgett Highway, Atlanta — Otherwise known as State Route 56, the Mike Padgett Highway forms an upside-down question mark that connects Reidsville and Augusta. Lee Street Southwest, Atlanta — U.S. Route 29 cuts through Atlanta on Lee Street Southwest, and part of U.S. 29 was renamed the Roosevelt Highway in honor of Franklin Delano Roosevelt. Interstate 85, Atlanta — I-85 cuts from the southwest corner of Georgia to the northeast, and this interstate also recorded five fatalities. The next five most dangerous highways were Wesley Chapel Road in Decatur, another stretch of I-85 in Atlanta, Martin Luther King Jr. Drive Southwest in Atlanta, Old National Highway in Atlanta, and Houston Road in Macon. The Georgia Governor’s Office of Highway Safety reported that 1,430 people were killed in motor vehicle accidents in Georgia in 2015. This was the highest total in the five-year period dating back to 2011. Of the total fatalities in 2015, 561 were occupants of passenger cars, 212 were in pickup trucks, 184 were in utility trucks, 50 were in vans, 26 were in large trucks, and 20 were in other or unknown vehicles. The fatalities also included 152 motorcyclists, 193 pedestrians, 23 bicyclists, and nine other or unknown non-occupants. Among the 1,430 fatalities, 775 were single-vehicle accidents, 182 involved a large truck and 268 involved speeding. Another 335 involved a rollover, 760 included a roadway departure, and 369 crashes were intersection-related. According to the Governor’s Office of Highway Safety, there were 385,221 total crashes in Georgia in 2015. The accidents resulted in 19,405 serious injuries. Both totals were the highest of the period dating back to 2011. Car crashes can often have serious and sometimes fatal consequences for those involved. If you were seriously injured or your loved one was killed in an automobile accident in Georgia, it is critical to hire a legal team that has the experience and skill to help you get the compensation and justice that you deserve. The Spiva Law Group represents clients all over the greater Savannah area. You can have our firm provide a complete evaluation of your case when you call us or contact us online to schedule a free consultation.